During my recent stay in Budapest I visited two fascinating exhibitions. At the Hungarian House of Photography in Mai Mano House I finally came face to face with the work of Vivian Maier. The salvation of her archive and the discovery of the quality of her work has been one of the most astonishing stories in the history of photography in the last few years. Maier's photographs of Chicago in the 1950s and 1960s are up there with the best. It is almost as if Maier is the missing link in the development of the medium. 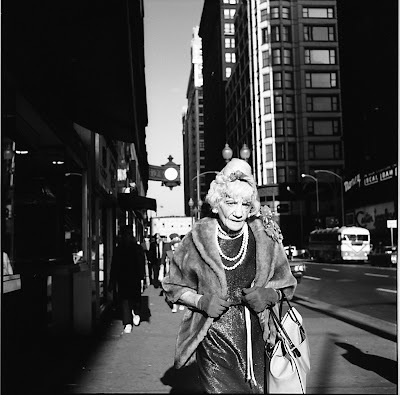 Her work shows the humanity of Diane Arbus and Lisette Model in her depiction of all layers of society as she encountered them in the street. It contains the vivacity and playfulness so characteristic of Helen Levitt's work. It has the audacity and in-your-face quality of both Garry Winogrand and Weegee. Her use of mirrors and shop windows as reflecting surfaces reminds me of Saul Leiter. And with some urban landscape photographs she acknowledges the influence of Rodchenko's radical compositions and perspectives. Nonetheless, Maier's pictures are undeniably her own. They provide an intriguing record of urban America in its heigh day. The presentation is strong and coherent both visually as well as thematically. Perhaps this is simply the result of the edit done by John Maloof, the amateur historian who rescued Maier's negatives. If so, he has done an admirable job. Regardless, the pictures are amazing. There is a real connection between Maier and the people she photographed. Even though it seems at first that her images are exemplary of Cartier-Bresson's adage of the decisive moment, I actually believe she has considered carefully how and when to press the shutter. The compositions are simply too strong, the exposure too good, the focus too sharp, the bond with the models too direct to be mere snapshots. Speaking of snapshots, only a few yards down the street from the Hungarian House of Photography in Mai Mano House is the Ernst Museum, which hosts the exhibition 'Ai Weiwei - New York 1983-1993'. This show has been put together by the Martin Gropius-Bau in Berlin, where it premiered as well. Ai Weiwei has shot to true global fame in recent years with his show at the Tate Modern, his contribution to the Bird's Nest Olympic Stadium and his political activism in China. 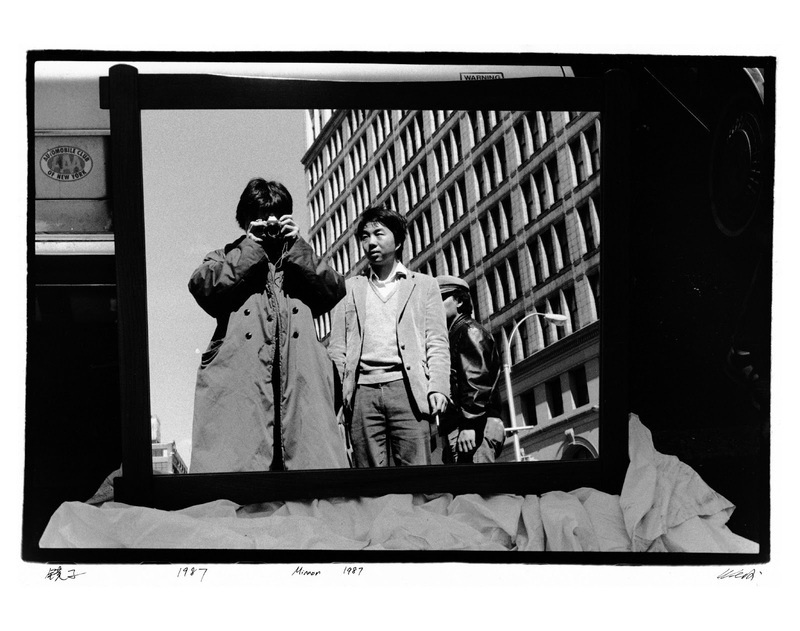 The photographs on show are from his period in New York, where Ai Weiwei initially went as an art student, and then stuck around for the next ten years. 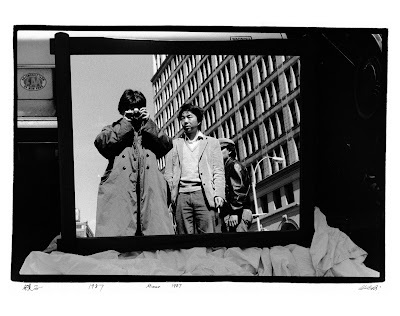 Ai Weiwei makes photographs, but he is not a photographer. The work is essentially a record of his daily life. Maybe Ai Weiwei has unconsciously tried to use photography to capture time before it got lost, just like Marcel Proust tried with his writing. Especially the early work shows intimate images of young people fooling around, having a good time and slumming about in a big city, making ends somehow meet whilst working in underpaid jobs. It is Larry Clark without the drugs, it is Nan Goldin without the sexual connotations. At the same time it is a portrait of an immigrant community made by an insider. More importantly, as the work is chronologically ordered, not only do we see Ai Weiwei progress technically, but also do we see him mature artistically. Photographs of his friends become interspersed with wry observations of life in the United States. Despite the American dream, this is not paradise. This become obvious in his record of the many protests taking place in the city during his stay, especially of the riots in Tompkins Square Park. Ai Weiwei photographs pretty much compulsively, and he embraces imperfection. Instead of choosing to present aesthetically pleasing highlights from his archive, he has opted to show single photographs interspersed with proofs. This gives him the opportunity to present many more images, but also to show how photographs are taken and how they are edited. It also makes perfectly clear that sometimes presenting a record of events in single, iconic images is simply not good enough.